DO YOU WANT TO DESIGN YOUR OWN RING? Our team of experienced Jewellers will help you. We will draw a design which meets the brief. On approval, we will begin the construction process. You will be invited to engage with this at every stage to make sure everything is meeting your satisfaction. 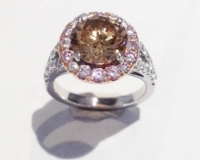 We can work in any metal, use any shape of diamonds and gemstones, whilst fulfilling any price point. piece of jewellery which could truly be one of a kind. Please email or call 020 7405 6000 to start working on a bespoke piece with us.